LaLa Feels Blah-La Receives a 5 Star Readers’ Favorite Review! Today is a very happy day! 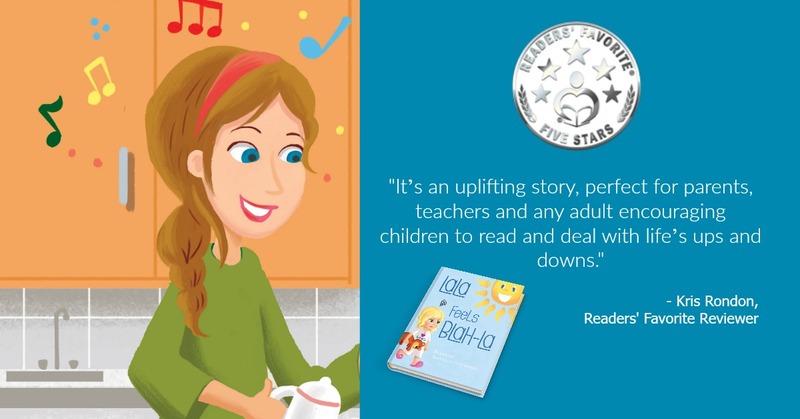 “LaLa Feels Blah-La” received a 5-star review from Readers Favorite reviewer, Kris Rondon and earned its first seal of approval. Here’s the complete review. Thank you, Kris, for your kind words! “LaLa Feels Blah-La by Tela Kayne is about a little girl named LaLa who wakes up one morning feeling low for no particular reason. Her mother tries her best to get LaLa into a better mood by trying to coax her out of this ‘Blah’ mood. However, LaLa’s mother’s attempt to get LaLa to change her mind and improve her spirits is not initially successful. Finally, she explains how she, Mom, changes her low moods. Mom explains that every time she starts to feel icky, she thinks of a happy thought and everything changes. She suggests that LaLa try this too. It works! Mom succeeds in changing LaLa’s mood and teaches LaLa how to cope with black moods. The illustrations are perfect for young children. Visit “LaLa Feels Blah-La” on Readers’ Favorites for more!